I ended up not going to two events; Tuesday’s events were misses as I took part in a Pub Run sponsored by Running Warehouse instead. Still had a beer though – a Rouge Hazelnut Brown. I also missed the Friday Nor Cal v. So Cal event, but still had a Telegraph Brewing Stock Porter. I did still make it to Creekside Brewing where I had their clone of Heretic’s GramaRye and the Heretic Chocolate Hazelnut Porter listed below. Here’s my stats and finds for the week. I had a total of 70 different beer tastings, and 27 full pints. It was rough at times. Here’s a list of those that stood out to me. These are in no particular order. Sierra Nevada – Trip in the Woods Scottish Ale. Smelled like a forest but what an incredible flavor without overbearing hops. Lost Abbey – Cuvee de Tomme (Sour). Amazingly complex. You could drink a single 22oz bottle all day, contemplating life and the flavors and still not taste everything that was in that beer. Ballast Point – Three Sheets Barleywine. An incredible example of a barleywine. Bourbon, cheery, loads of caramel flavors. Stone – Fyodors Imperial Stout. Bourbon barrel aged and incredible. Not overly bourboned. Ale Smith – Speedway Stout w/Vietnamese Coffee. Much more subtle coffee flavors than normal. Let this come closer to room temp though. It was poured way to cold. Heratic – Chocolate Hazelnut Porter – CASK. This was the only one of the beers that was special just due to storing and pouring. I’ve had CHP a number of times, but none like this. It was smokey and beautiful. Bubbles were inconsistent and it just gave this normally smooth beer a rough, home brewed feel. It brought me back in time. The one event that surprised me in cost was the SourFest at Eureka! Burger. Due to the way they handled tastings, $20/4, it got very expensive to try as many beers as I could. You do have to put it into perspective though. If you’re not a huge sour beer fan, the chances of having each of these beers would be slim to none. Sours tend to be pretty pricy to begin with and typically come in 22oz or 750ml bottles. If you don’t like them, that’s a lot of wasted beer and money. In the end it made sense and I’m happy to have done it. 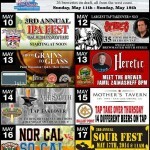 Thanks to Central Coast Distributing for putting this event together and working so hard to make it a success. Can’t wait for next year!